Hundreds of rental apartments are coming to the Wynwood Arts District, tucked inside a dark mixed-use structure that promises to celebrate art in many forms. While Wynwood has been booming with new bars, shops, cafes, studios and other businesses, the popular venue has been lacking residences. Wynwood 25 is prepared to help fill that need. The project is planned for 277-339 NW 24th St. and 240-292 NW 25th St., immediately west of Northwest Second Avenue. At 400,000 square feet, Wynwood 25 is to include 289 rental apartments, about 31,000 square feet of ground floor retail and 340 parking spaces. The project was evaluated Monday by members of the city’s Urban Development Review Board, who recommended approval on unanimous vote, with some conditions. Due to inclusion of what the developer is calling a mezzanine level, some board members saw the proposal as a nine-story building on one end. The board asked that the developer clarify the height with city staff. The project is included in an area covered by a new zoning overlay, Neighborhood Revitalization District-1 or NRD-1. A key component of Wynwood 25 will be a grand pedestrian paseo, a public walkway framed by art with subtle curves and very limited vehicle access for drop-offs. Another condition is that the developer re-evaluate the massing of the north façade and perhaps make it more similar to the proposed southern façade. Developer East End Capital requested several waivers including permission to increase the lot coverage from 80% to 84%, allow vehicle access from a primary frontage and allow a 10% reduction of the required parking. The project was also reviewed by the new Wynwood Design Review Committee, which recommended approval with conditions including incorporating more color into the ground floor, introducing art elements into the canopy, screening lights in the garage, using painted signs on the building itself and more. 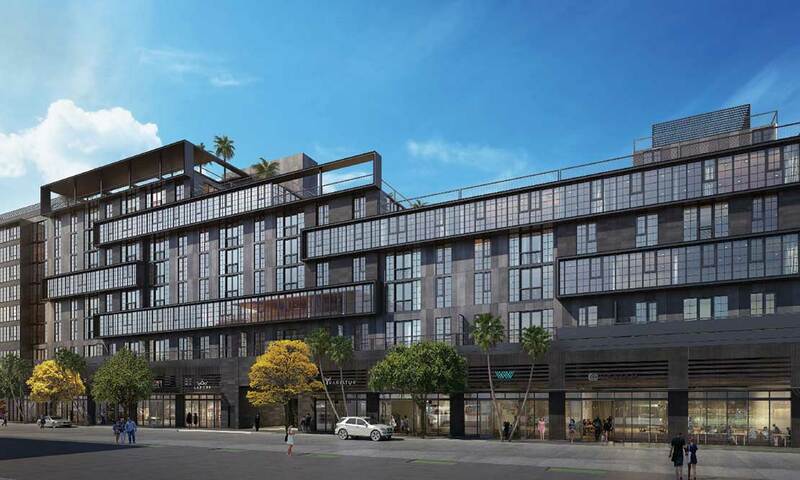 Steve Wernick, an attorney representing the developer, said this project in the heart of Wynwood will help connect different parts of the neighborhood. He said the building is eight stories tall at its highest, with some lower portions offering transition and an active amenities deck. He said he’s really excited about the paseo, with its art elements in the floor, ceiling and walls. The project also includes a green space interior courtyard, he said. The Kobi Karp-designed façade incorporates an industrial motif, recalling Wynwood’s history. The building is anchored by a woonerf-inspired paseo, connecting 24th and 25th streets – a Dutch-styled pedestrian-friendly street. The paseo will break Wynwood’s long east-west blocks, offering pedestrians a better experience and reinforcing the exploratory nature of the community, said Mr. Karp. David Polinsky was wearing two hats at the Monday meeting. He said he is local development manager for the project and heads the Wynwood Design Review Committee. He answered questions about the paseo and other items. Mr. Polinsky said the paseo will be a one-way, single-lane street, north to south. “This project really embraced the [Neighborhood Revitalization District],” he said. “Think of it as a high-rise turned on its side,” Mr. Polinsky said of the building, with the façade broken up by ground floor retail uses. Mr. Polinsky said the plan calls for two restaurants, and the paseo is designed wide enough to accommodate outdoor seating. Board member Fidel Perez said it’s a nice looking building but doesn’t seem to fit in artsy Wynwood because it’s so dark. “They felt it blended in,” Mr. Karp responded. Mr. Perez said he feels the main façade needs more art. Board member Robin Bosco said he liked the form and appreciated the dark presence on higher floors, but felt more lively design at street level would improve the look. Mr. Marston also noted the overall darkness of the building. “This is an eight-story building that is dark. It doesn’t fit in the total context of Wynwood … lighten some of it,” he said. The developer is looking at a targeted groundbreaking for the first quarter of 2017. East End Capital said Wynwood 25 will feature highly-efficient, cost-conscious apartments. It is expected that 80% of the units will rent for less than $2,000 a month. The apartments, which will be predominantly studios and one bedrooms, will all feature 10-foot ceilings, luxurious kitchens and bathrooms, and full-sized washer/dryers, the company said. Amenities are to include a large state-of-the-art fitness center with yoga studio, collaborative work-from-home spaces, a coffee lounge opening to the building’s 12,000-square-foot green courtyard, bike storage, package storage, and dog wash facilities. It is also to feature a landscaped roof terrace that includes a pool, spa, barbeque, outdoor and covered work areas, and green areas. East End Capital says it’s one of Wynwood’s largest property owners and is committed to preserving and enhancing Wynwood’s artistic and creative community. In addition to this project, East End Capital recently completed the Wynwood Arcade at 50 NW 24th St., which houses The Salty Donut, Bonobos, a new culinary and craft cocktail experience from Chef Norman Van Aken and other local boutiques. The Wynwood Arcade is inviting and fun. This proposal by the same developer is dark and scary. Tobi Karp is a gifted local architect. He can make it more Wynwood. I agree that it’s not fun at all, but I understand why East End Capital chose a simpler design. In order to be able to underwrite rents as low as $1,600/mo you need to keep it simple, if not, you end up with an expensive project like 250 Wynwood that no local can afford.